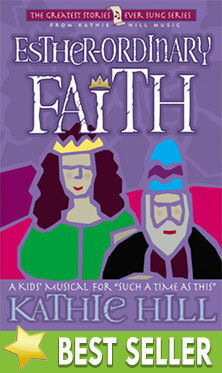 Esther-Ordinary Faith : Kathie Hill Music, LLC, Making music with and for kids for over 25 years! In the musical, a fictional scribe, Zerox, details Esther becoming queen through God's intervention in Haman's plot and Mordecai's appointment as the king's adviser. And, as Zerox tells the story, he experiences the testimony of Esther and develops his own faith in God and His grace. All this is done through gritty songs and witty dialogue between these characters and the residents of Susa, the "Susans." Songs like "God Is in Control," "The Eleventh Hour," "While You Sleep" and "In That Moment," will help children understand the sovereignty of God and the confidence we can have in trusting Him with the greatest of problems by displaying our own Esther-Ordinary Faith! Speaking Parts: 9, plus 16 one-liners in "God's Child"
We did this musical for the first time in 2013 & our kids LOVED, LOVED, LOVED IT!!! They kept asking: "Did this really happen in the Bible?" The costuming was so fun for both girls and boys and the ease of scenery was awesome. Beautifully written & crafted characters & the Old Testament story was magnificent!!! Parents & kids loved it! Our children LOVED being part of this musical! The demonstration video for the movement and the devotionals and suggestions in the DAV helped led to an excellent presentation. Workers, children, directors, everyone enjoyed putting this together. Our favorite song was "God is In Control" which we sing around our house when we need that reminder! Thank you for yet another excellent and fun musical! Songs, script, production notes, piano transcription. Downloadable 3x licensed PDF of all songs, script, production notes & piano transcriptions (up to 125 pgs) with permission to make 3 copies . Additional copies require purchase of additional 3x license/s. Up to 200 downloadable PDF pages of lesson plans, kick-off ideas, Musical Activities, spiritual activities and production & organizational helps. Downloadable orchestrations for 3 songs with brass.